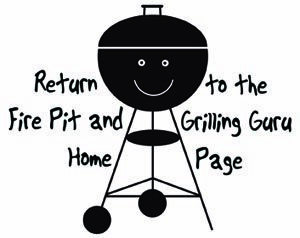 just going to a friend's house with no grill, a portable outdoor grill is convenient, simple to use and allows you to cook most of the same great barbecue foods you would on a larger grill. With these grills got the Weber® name and all the years of experience, support and features that you've come to expect from Weber®. These portable grills come in both gas and charcoal models. They can sit on the ground, a picnic table or any other solid surface. All Weber® grills come with a Weber cookbook and a limited warranty. Go-Anywhere® Series - The Go-Anywhere® series includes both a charcoal and gas Weber portable grill. Both have a 160 square inch cooking area with a porcelain-enameled base and lid, heavy-duty folding legs. Its rectangular design is compact, easy to carry and fits in any car easily. The gas version has a push-button igniter and runs on disposable 14.1 oz. propane cylinders which are not included. Optional adapters to a 20-lb. tank is also available. 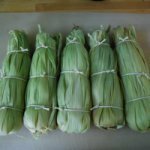 This is a great, easy portable barbecue for any trip. Smokey Joe® Series - The Smokey Joe's are basically a mini version of the famous kettle-type Weber charcoal grill, the One-Touch® Silver and Gold, with the familiar kettle shape. They are simply smaller and with short metal legs for portability. It comes in a Silver and Gold model. Both feature a porcelain-enameled bowl and lid with a 14.5 inch diameter cooking area (just slightly larger overall surface area than the Go-Anywhere® series). The Gold version incorporates a lid lock for carrying which also lowers and doubles as a lid holder while cooking, making this version slightly easier to transport and for functional. Another great Weber portable grill with the classic kettle grill design. Q-100: This is the smallest Q-grill with 189 sq. in. of cooking area and 8,500 BTU-per-hour output. Stainless steel burner, removable drip tray, porcelain-enameled cast-iron cooking grate and push button ignition all come standard. Q-120: This Weber portable grill is basically the same as the Q-100 with the addition of folding work side-tables with tool holders. 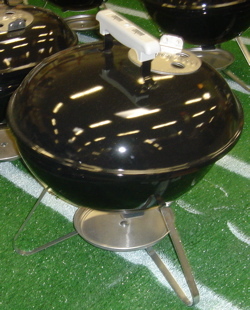 There is also an optional rolling cart that is specifically designed to hold this grill. Q-200: This portable grill is a bit bigger, with 280 sq. in. of cooking area and 12,000 BTU-per-hour of heat. The other features and options are similar to the Q-120 with side work tables. Q-220: This is the same size and power as the Q-200 but has an in-lid thermometer and has an optional stationary or rolling cart. Q-300: This is another step up in size to 393 square inches and 21,700 BTU with 2 stainless steal burners. It uses a 20-lb. propane tank and bolts to an included stationary cart with wheels. This grill, because of its added size and cart is really not as portable as the other Q™ series barbecues. It is compact compared to other full-sized gas grills, with a small footprint. However, for optimum portability, this is probably not the best option. There you have it! The full series of Weber portable grills! All of them have their virtues so choose wisely. You really can't go wrong with any of them. 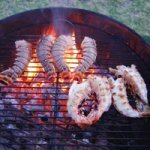 Done learning about the Weber portable grill series? 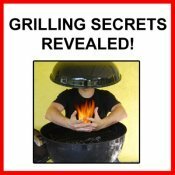 Find out about other types of grills and barbecues.